California cultural and historic ties with Spain stretch back almost 500 years to the Spanish colonization of Nueva California in the 16th century. 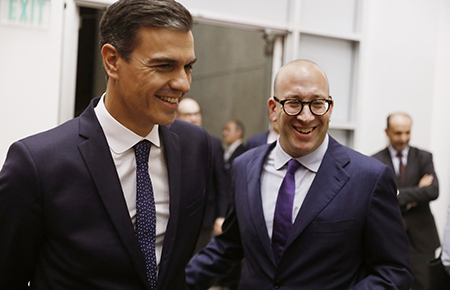 So, last week’s visit to the Golden State by Prime Minister of Spain Pedro Sánchez Pérez-Castejón — the first by a sitting Spanish head of government — was a historic occasion. This was especially true for Trojans, as Sánchez, fresh from his address to the United Nations Assembly earlier in the week and a meeting with California Governor Jerry Brown, made time to visit USC on Sept. 28 to deliver a President’s Distinguished Lecture. Sánchez’ inspiring speech moved the packed crowd of students, faculty and alumni in Bovard Auditorium on USC’s University Park Campus to a standing ovation. Michael Felix, president of the USC Alumni Association, introduced Sánchez, noting that while we live in times of great political debate worldwide, listening to different points of view is at the heart of USC’s mission. Prime Minister Sánchez, who is secretary-general of the Spanish Socialist Workers’ Party, was sworn into office on June 2, 2018. Although he has led Spain for only four months, he has already made headlines worldwide after appointing a cabinet that is nearly two-thirds female. Sánchez reminded students that they are “the change makers and the leaders of [their] own time.” He urged them to avoid complacency by getting involved, telling them they have a responsibility to act in service of the common good. Noting that if previous generations had not questioned and pushed back, we would not enjoy the freedom, prosperity and technological and medical advances that we do today, Sánchez told students not to allow themselves to be intimidated by the challenges their generation faces. Sánchez said that despite great historical struggles, including a bloody civil war followed by a brutal dictatorship that condemned thousands of Spaniards to death and exile, Spain eventually found its way to a free and democratic society. The country was one of the first to legalize gay marriage and pass a comprehensive law against violence against women. “Dear friends,” he said, “today I am proud to show you a Spain … that even in the worst of the economic crisis did not get carried away by a message of hatred and division,” he said. Noting Spain’s presence in California for almost five centuries, he paid tribute to Los Angeles for its vibrant language and culture. In addition to the lecture, Sánchez visit included meetings with a number of faculty and administrators, including USC Dornsife Dean Amber D. Miller; Robert Shrum, Carmen H. and Louis Warschaw Chair in Practical Politics, professor of the practice of political science and director of the Center for the Political Future; and Jacob Soll, University Professor of Philosophy, History and Accounting, who was instrumental in arranging the USC visit.